JNN 21 Nov 2014 KARBALA, Iraq : Millions of people are making their way to Karbala, Iraq to visit the shrine of Imam Hussein (as) on Arba’een / Chehlum. It is the 40th day commemoration of martyrdom of Imam Hussein (as). Men & Women, children and elderly, healthy and handicapped are seen walking towards the shrine of Imam Hussein (as). Iraqis from all over the country (Basra, Najaf, Baghdad, Mosul) participate in this walk. Also an increasing number of international pilgrims from the Middle East, India, Pakistan, Iraq, Iran, Azerbaijan, Turkey, Europe, Africa and North America are also taking this journey of a lifetime. The lovers of Imam Hussein (as) take this walk especially from Najaf to Karbala on Arba’een / Chehlum. Ali Jaafar was all set to cross around 125 kilometers (78 miles) On Foot , from his residence in al-Diwaniya city, south of Baghdad, to the holy city of Karbala on the holy day of Arbaeen to commemorate the 40th Day ( Arbaeen ) of the Martyrdom of Imam Hussein Bin Ali a.s.
Imam Hussein was buried in Karbala after his Martyrdom in 685 A.D. by the Tribe of Bani Asaad , as he was Martyred by the Army of Yazid ibn Mouawiya L.A in the Sands of Karbala. Shiite Muslims from around the world perform a yearly pilgrimage to His Shrine in Karbala , as Most of the Shiites Residing in Iraq Perform on foot, weep at his grave and vow to defend his principles on Arbaeen. Thousands of people, including men, women, children and even handicapped people, participate in the annual event that has been celebrated since 2003. Before then, the pilgrimage was forbidden by Saddam Hussein’s regime. Jaafar, like thousands of others, has gotten used to performing this annual pilgrimage On Foot . 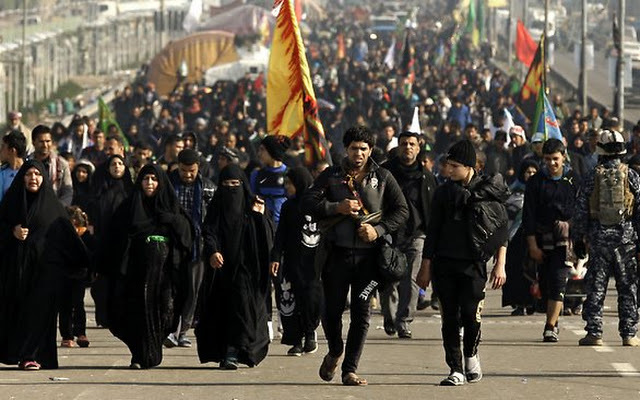 But, this year, the march will be easier, as a new road, dubbed “Ya Hussein,” has been constructed and designated for the Shiite pilgrims visiting the holy city By Foot . Umm Heidar, a housewife, told Press that last year, she covered around 50 kilometers (31 miles) during her journey, which started from Hamza al-Gharbi city to Karbala. She walked through fields and villages instead of taking the main road, as most pilgrims do. “Ya Hussein Road was not complete yet at the time, and I had to take the byroads, to which we had grown accustomed before 2003. The security officials in the former Iraqi regime of the Dictator Saddam Hussain, which forbade Shiites from performing this religious ritual, did not watch the byroads,” she said. All along the road, large tents have been set up for the pilgrims to sleep in. Volunteers supply whatever the travelers need. Many pilgrims have lost their lives during their pilgrimages to holy Karbala since 2003 in bombings and armed attacks. The road has become a symbol of Shiite faith in Iraq. The Shiites have sought to build infrastructure that makes it easier for them to practice their religious rituals, away from attacks by the Islamic State, which targets Arbaeen pilgrims each year. This entry was posted in Middle East and tagged Arba'een, Chehlum, Hussein Bin Ali, Imam Hussain a.s, Imam Hussein, Karbala, Saddam Hussain, Saddam Hussein, Shia Pilgrims. Bookmark the permalink.